Beci Orpin is well-known for her beautiful illustrations and design. What a joy it was to see her branch into children's books with this look-and-find creation of delightful mixed imagery. Collage-like double-page spreads feature thematic imagery--the contents of a toy box, a bathtub, a garden, a fairground, a museum--that are busy in a deceptively calming way. There's a lovely balance of white space, textures and pattern that supersedes the regular, eye-scratching seek-and-find concept, making it more a picture book than an 'activity' book. 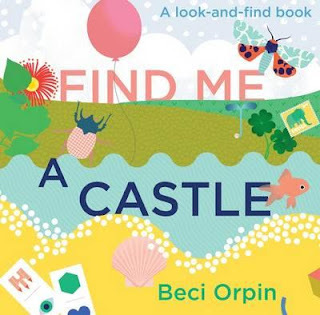 Rhyming text asks the reader to find certain objects on the page, and a delicious colour palette of graphic illustrations make this something adults will enjoy as much as children. A wonderful introduction to design concepts and variant illustration style, and absolutely fabulous for visual literacy.